"The way the inner world meets the outer world in these poems is extraordinary." "Whether you are a reader or a crafter of words, Tom Kepler's poetry renews your appreciation for the beautiful." black earth beneath long fingernails. 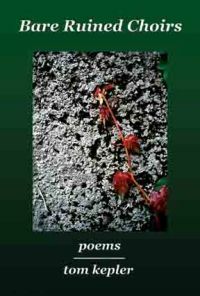 This poem, the first in the book, is one read by me in the Radio KRUU interview. Prior to publication in California Quarterly, the editor asked, "Is this a poem about a woman or a tree?" The answer to that question was "both." The poem was accepted for publication.